Ramshackled is a novelette about Allie, an emotionally troubled African- American woman who has been damaged by a lifetime of loss. Allie works her way back to her community with the help of her Great Aunt Nina's spirit and an old house that is in need of some TLC. 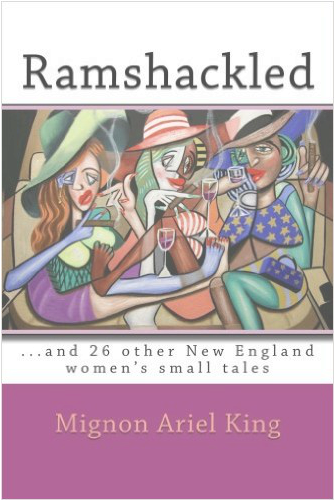 Rosebud... is a collection of 26 microfictions about 26 very different New England women who are all restructuring their inner and outer lives. This is TTC Publisher Mignon Ariel King's first collection of stories. The setting of all 27 stories is King's beloved ancestral home, New England. Jason Wright is the editor and founder of Oddball Magazine. He has been published in the Somerville Scout, Fox Chase Review, Wilderness House Literary Review, Stone's Throw, Somerville Times, and other publications. In 2014 was selected to read "Strong as the Boston Skyline" at Boston City Hall's tribute to survivors of the Boston Marathon bombing. Oddball Magazine was featured at the Massachusetts Poetry Festival in 2014, and Wright has read at the Cambridge River Festival for four consecutive years. He was given a Certificate of Achievement from former Poet Populist of Cambridge Toni Bee and the English Department Award of Achievement from Bunker Hill Community College. Wright studied under Lloyd Schwartz at UMass Boston as well as Joe Torra. He earned a Literary Publishing Certificate in 2010 from Gian Lombardo, Editor/Founder of Quale Press. He is a regular at the Stone Soup Poetry Series in Cambridge and can also be found every Tuesday in his column "Jagged Thoughts" at www.oddballmagazine.com. Creative and intellectual social misfits come together to form an alternative multicultural community in Massachusetts after two of them fall in love in this historical faction novella. The book is King's first work of fiction, loosely based on what might have been. The old-fashioned yet free-spirited Beantownie Emmie may have found her prince. Too bad she wasn't looking for him! Tech wizard and visual artist Mark Moon grew up surfing beaches in California while yearning for a traditional relationship. Did fate bring this odd couple together years after a brief but intense friendship? You decide. Cover Art: Copyright 2009 Aminah Jones. All rights reserved. relationships, those of lovers and of friends, through poetically-written, rich and colorful imagery." Site copyright 2018 Mignon Ariel King dba Tell-Tale Chapbooks. Text and images copyrighted as attributed per individual writers and visual artists. Posting a link is greatly appreciated! Kindly ask before reproducing images or text from this site other than calls for submissions.